The print size is 18" x 21". 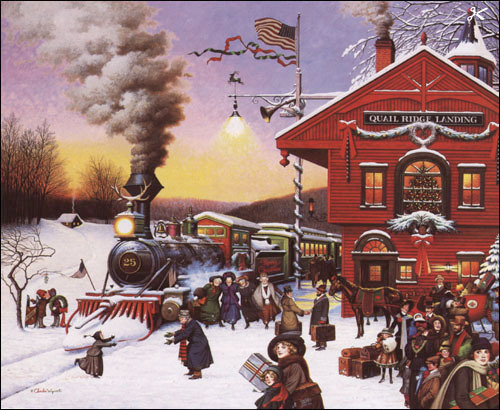 The Greenwich Workshop Christmas print has become an eagerly awaited tradition among art collectors and gift givers everywhere - a tradition that began in 1982 with Charles Wysocki's first limited edition fine art Christmas print, and continues with the delightful. Whistle Stop Christmas . Wysocki shares his loving memories of Christmas past with you, complete with the wonderful details and dozens of little charming stories his limited edition prints are famous for. There's a clever boy laying a mistletoe rendezvous for his favorite girlfriend, happy families sharing the joys of the season, and new friends making contact. "This painting projects my youthful thoughts, Wysocki says happily, "and exemplifies the feelings held dear for Christmas time. It embodies the spirit of goodwill in all of us." Share the goodwill with all your friends and loved ones in this special Whistle Stop Christmas . 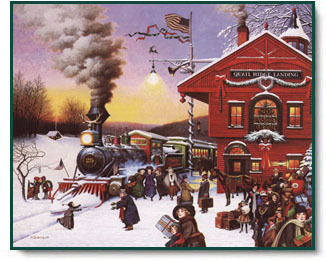 1991 Christmas Print: Whistle Stop Christmas copyright© 1991 by Charles Wysocki.